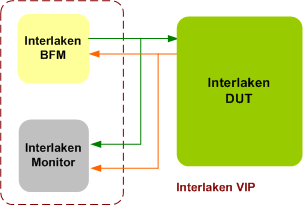 The Interlaken Verification IP is compliant with 1.2 specifications and verifies Interlaken interfaces of designs Interlaken Interface. It can work with SystemVerilog,Vera, SystemC, E and Verilog HDL environment. Interlaken VIP is developed by experts in networking, who have developed networking products in companies like Intel, Cortina-Systems, Emulex, Cisco. We know what it takes to verify a networking product. Implemented natively in OpenVera, Verilog, SystemC, Specman E and SystemVerilog. Follows Interlaken specification as defined in Interlaken protocol definition v1.2. Compliant to Interlaken protocol specification v1.2. Compliant to Interlaken look aside protocol 1.1. Compliant to Interlaken retransmission extension specification 1.1. Supports multi-channel implementation as per the specification. Supports configurable number of serial lanes as per the specification. Supports configurable burst max and burst short sizes. Supports insertion of extra idle to guarantee the avoidance of burst short. Supports scheduling calendar logic in the transmitter to choose the order in which the channels are serviced. Supports optional scheduling enhancement to avoid unused bandwidth by using decision algorithm. Each burst of transmitting data is encapsulated with burst control words before and after the data. Support configurable number of lanes from 1 to 64 lanes. Supports per channel inband and out of band flow control or both. Per-lane CRC-32 insertion into diagnostic words. Configurable control to enable or disable the scrambler. 64B/67B encoding with inversion bits controllable. Variable test pattern generation as per specification. Receive logic loses word boundary sync. All types of CRC error injection. Invalid coding for all control words. Comes with Interlaken Tx BFM, Interlaken Rx BFM, and Interlaken Monitor. Supports Interlaken interop recommendations 1.3 and 1.4. Rich set of configuration parameters to control Interlaken functionality. Supports 67 bit bus per lane or 1 bit serial lane to ease the debugging. Callbacks in Transmit, receiver and monitor for various events. Interlaken Verification IP comes with complete testsuite to test every feature of Interlaken protocol specification. SmartDV's Interlaken Verification env contains following. Complete regression suite containing all the testcases.